Polish-Lithuanian heavy lancers, Winged Hussars were used as elite Polish-Lithuanian shock troops for over two centuries. They fought in many wars including Polish-Muscowite war (1605-1618), Polish-Ottoman war (1672-1676) or period known as the Deluge (1655-1660, Polish: Potop). They evolved from Serbian mercenary cavalry. Hussars were first adopted by Hungarian army as light cavalry, later transforming into plate-armored shock cavalry. To differ from Hungarian hussars, Polish-Lithuanian hussars came with their own style. These wings were made from wooden frame and eagle, ostrich or swan feathers. Due to conflicting accounts, it is not known whether they were worn in battle. Some of them suggest that wings were worn to make the charge look larger and to scare enemy horses. Winged Hussars are also known to have worn strips of fur from leopard, wolf or other predator for the same purpose. Some also suggest that these wings offered some protection from sabers or Tatar lassos. 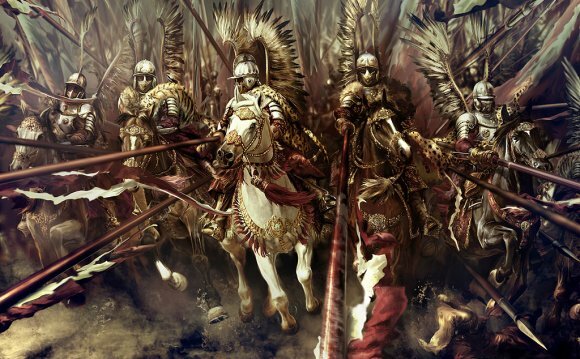 Winged Hussars were famed for their hard charge. They started in loose formation and slow pace, gradually accelerating and closing the formation, achieving maximum speed and tightness right before impact. After the charge they tended to disengage the enemy and rearm to charge again (wagons of spare lances were supplied on battlefield). If disengagement wasn't possible, Winged Hussars used variety of sidearms (sabers, swords, pistols or carbines) to fight their way out. Keep in mind, that Winged Hussars often charged directly into enemy gun and artillery fire. Up to 300 000 Ottoman troops were besieging Vienna, when 100 000 men strong relief force of Polish-Lithuanian and German troops arrived. After 13 hour long infantry battle, Polish-Lithuanian cavalry emerged from forest, led by king Jan III Sobieski. They managed to force Ottomans to retreat into their camp and staged the one final blow: 18 000 horsemen (3 000 Winged Hussars) charged the Ottoman camp from the hills. This was the largest cavalry charge in history. The charge easily broke Ottoman morale and ended the battle. Christian allies lost about 4 500 troops, Ottomans up to 20 000. As guns and artillery improved, heavy cavalry had less and less uses on battlefield. Winged Hussars were finally disbanded in 1776, when they were succeeded by much lighter Uhlans. Winged Hussars were one of the most effective military forces. Only losing a fraction of battles they fought in, they stood undefeated for 125 years since inception of the unit. What is Cavalry in the Army?